My mum doesn’t read my blog, I don’t think she really ‘gets’ blogs, so I’m safe sharing her Christmas present! 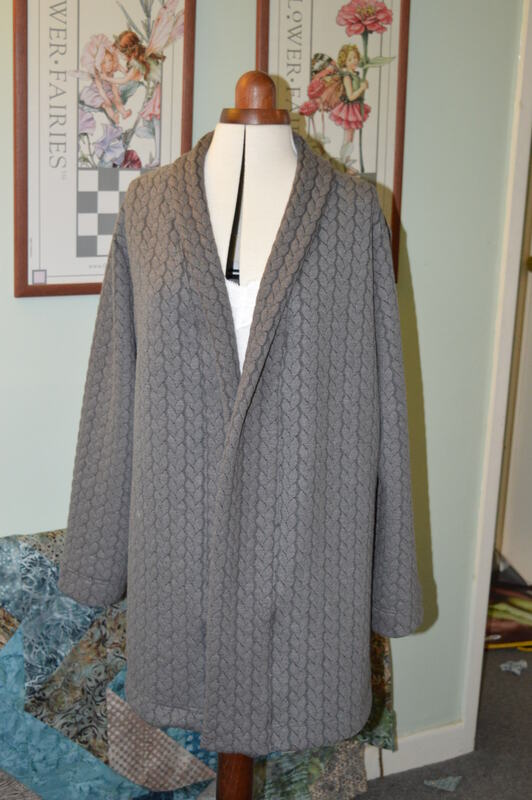 Last month I made a cardigan from some lovely cable knit fabric, it was one of my first forays into overlocking after my sewing course. It’s great to wear, really snuggly and warm. My mum was admiring it all morning when she first saw it, especially when she realized I’d made it. 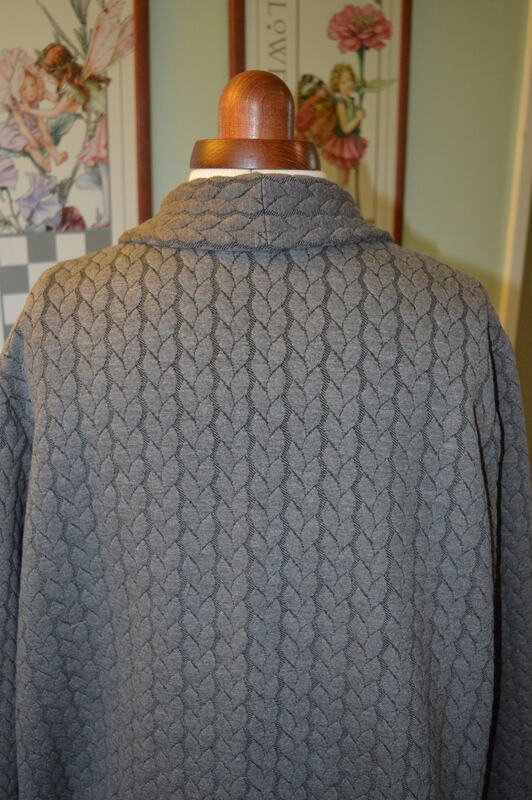 She asked if I could get her a length of the material so she could try and make one…now my mum used to do lots of dressmaking, she was very good, but I doubt she’s sewn anything apart from curtains for over 10 years. I promised I would look in the shop next time I was in Leeds. I used the same pattern, Butterick 6258. It’s designed to be just above the knee length, my mum does like her cardigans fairly long but she’s also at the age when, how can I put it, she’s not so tall as she used to be! I decided to cut 6″ off the length which will hopefully make it a nice length for her. I remembered the issues I had with the collar band pattern matching last time, so I cut the two sides out separately and rather than actually cutting round the pattern piece, I worked out how many cables across I needed and followed the fabric. I also cut it so the edge of the cable would be next to the seam-line. The pattern goes together really easily and quickly, I managed to get a good tension with my stitch, always a cause of stress with overlockers! I stitched the hem and the sleeve hem with a double row of top-stitching, I have to confess it was too much hassle to get a twin needle out and the spare thread holder. I’m really pleased with it and hopefully it will fit her nicely. 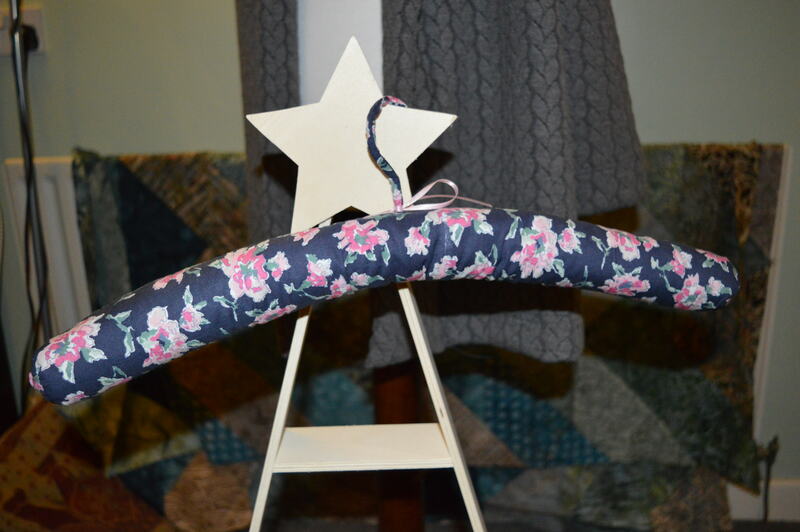 To complete the gift I made a padded coat-hanger to hang it on. When I was a poor impoverished student nurse I used to make a lot of these as presents. This year I worked out a new way of neatening up the ends by using buttons. I found a pretty dark blue flowery print, two pink buttons for the ends, and a length of pink ribbon for a bow. It looks really pretty and gives a bit extra to the present. I think I’m winning with Christmas presents with two more to finish, it’s a good job I’m on two weeks annual leave at the moment! This entry was posted in Christmas, Dressmaking, Serendipity, Sewing and tagged Butterick 6258, sewing knits. Bookmark the permalink. 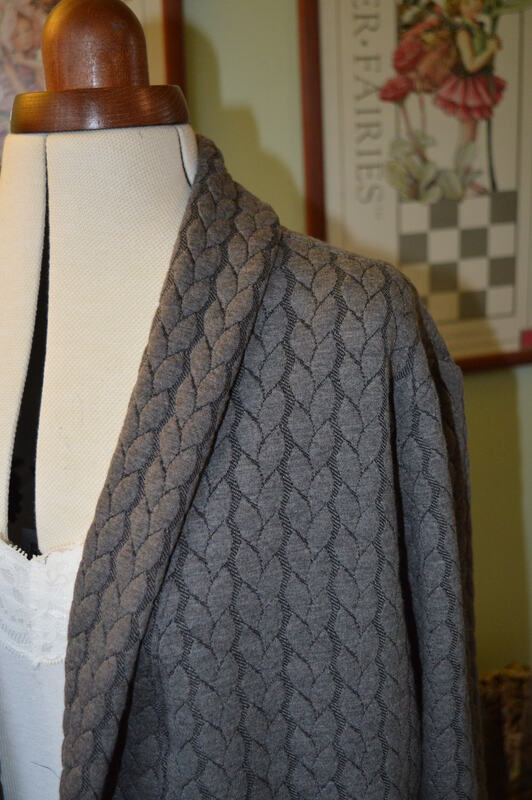 I loved your first jacket with this fabric and love this one too! It’ll make a fabulous present -especially when you know she already loves yours. Fortunately, it’s not really 100% fit crucial and I’m sure you’re in the right ballpark. I still haven’t made it to Leeds – I’d like to get this fabric too.